Every Ramadan, the IHRC publishes a newsletter reporting on its work over the previous year and the progress of the organization as a whole. This year’s newsletter is now available, for download and in hard copy format for physical distribution. The Islamic Human Rights Commission has been working for the last 16 years at several different levels simultaneously: helping individuals with their problems through our advocacy team; campaigning on major issues concerning Muslims generally, such as the targeting of Muslims in the ‘war on terror’; highlighting human rights abuses around the world; conducting research into social and political trends of particular concern, such as Islamophobia in Europe; and ensuring that Muslim concerns are heard in such forums as the UN and OSCE. At a time when disunity and sectarianism are plaguing the Muslim ummah, a call for a future that rises above the violence we have set upon one another needs urgently to be disseminated. From atrocities in Palestine to injustices in Bahrain and hate crimes, this year’s newsletter gives an overview of the research, campaigns and advocacy we have undertaken. Finally, of course, the newsletter aims also to say something about the IHRC itself, its ethos, its objectives and its priorities. This is reflected in the message from the Chair, Massoud Shadjareh, and on how people can help the IHRC as volunteers, interns, or by supporting our work in other ways, such as fundraising. 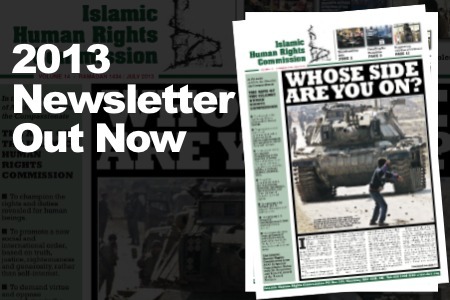 Please help us distribute the newsletter this year… for free copies for your family, friends and local mosque or Islamic centre, call the IHRC office on 0208 904 4222 or email: media@ihrc.org.